Here’s another one I’ve been looking at for a while. 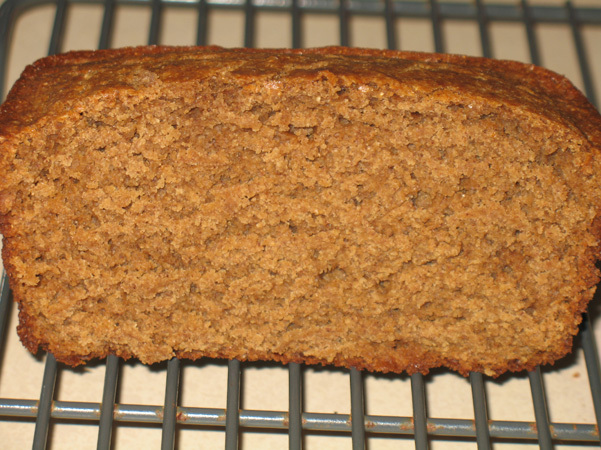 I don’t like baked apples in things, but I do love apple cider and apple-pie-type spices, so how could I resist a recipe for Apple Cider Spice Bread? The only thing keeping me back was the full stick of butter required, so I cut that in half and used yogurt and got lovely results. 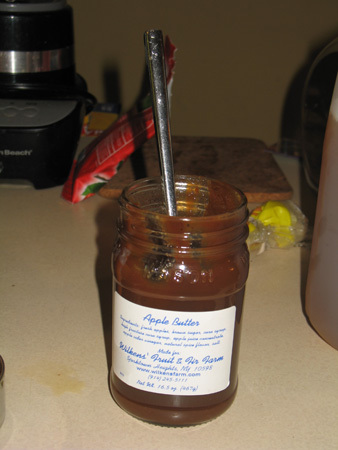 We went apple picking yesterday, and while we were there I picked up some fresh apple cider and some apple butter. Perfect timing. 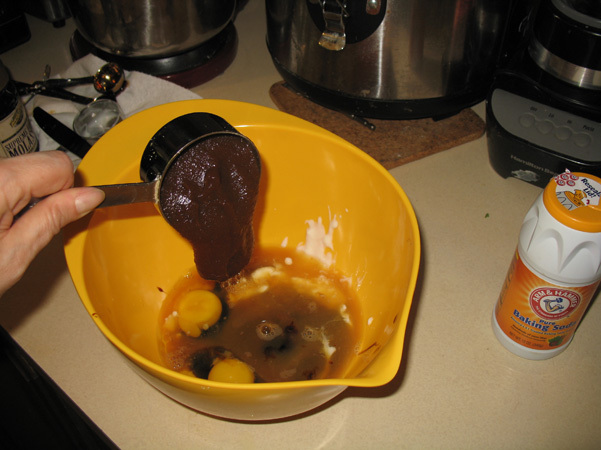 It’s not very attractive while it’s glopping into the bowl, but it’s not there for esthetics. I added it to 2 eggs, half a cup of packed brown sugar. molasses, yogurt, and apple cider. The last thing to go in was the melted butter. The recipe called for half a cup, so I halved that and used 1/8 of a cup of vanilla yogurt for the rest. I tried to space those two ingredients out as much as possible because hot butter and cold yogurt = disgusting lumpy scary something. Fortunately, the butter had had a chance to cool, so it didn’t really curdle or do anything to scare me away from it. 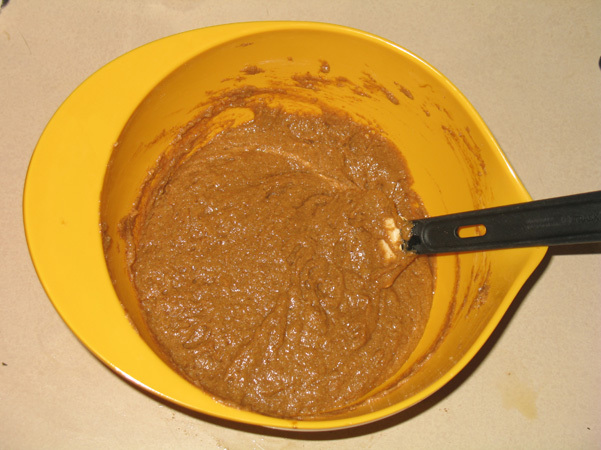 I whisked that all together, set it aside, and pulled together the dry ingredients in another bowl. 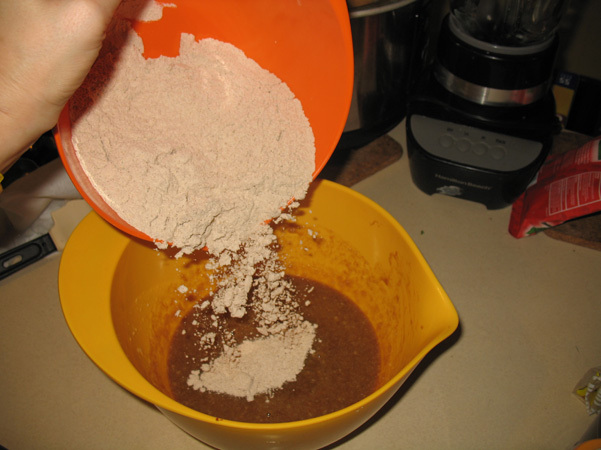 This included whole wheat white flour, baking soda, baking powder, salt, and spices. As always, I increased the spices, putting in 2 heaping teaspoons of cinnamon, one teaspoon of ginger, a little more than a quarter teaspoon of cardamom, and almost half a teaspoon of freshly grated nutmeg. Next time I’ll throw in the apple pie spice too! I whisked that together, then added it incrementally to the other bowl, stirring (but not overmixing) as I went. I poured that into a loaf pan, and put it into the oven, already heated to 350 degrees. Now the directions said to bake it for an hour, but the picture in the recipe showed the batter in a glass pan, and I thought that might have something to do with the cooking time. There’s some formula for switching types of pans and adjusting temperatures and cooking times, but I just set my timer for 30 minutes, no calculations involved. While it was baking, Juliet and I hung out. 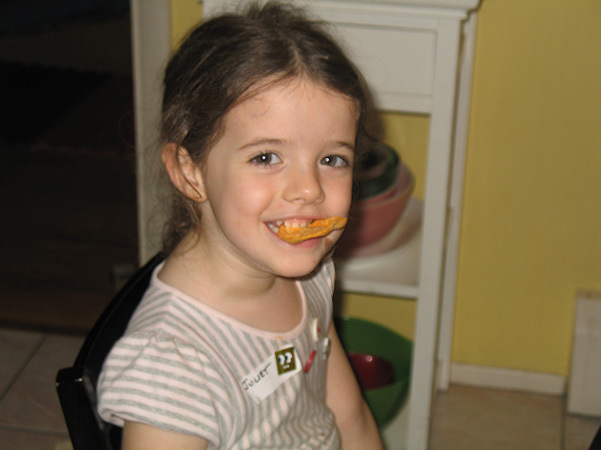 I read her new library books to her while she ate some barbecued Pop Chips. At thirty minutes, the timer went off, and the bread was done. I let it cool in the pan for 15 minutes, and then removed it. Actually, that’s sort of a lie. I set the timer for fifteen minutes, then hopped in the car and went to Target to buy some socks, and Dave took it out of the pan when it was time. Then I came home and photographed it. Texture is perfect. A lovely, soft crumb, just ideal. Flavor is there, but could have definitely benefited from more spices. 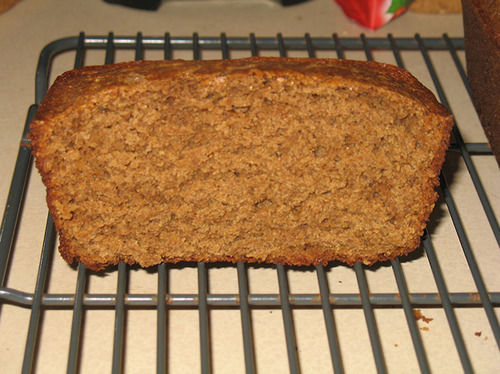 Tomorrow it may be more flavorful, as often happens with pumpkin-based breads, so I’ll update then. I like the flavor, it’s warm and comforting, but I think I can do even more with it just by adding apple pie spice and/or increasing everything else. It’s still a lovely creation. 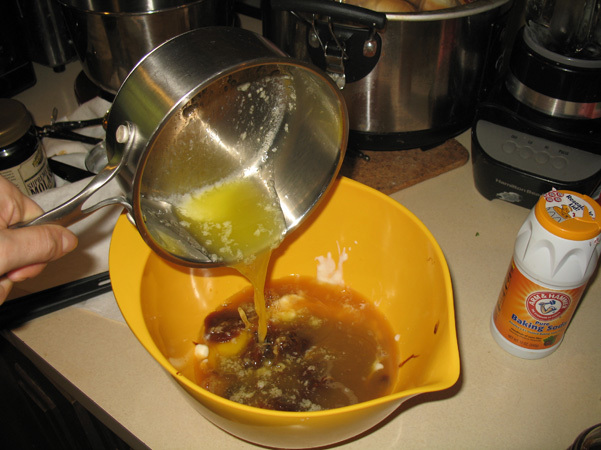 In a large bowl, whisk together the butter, yogurt, eggs, brown sugar, molasses, apple cider, and apple butter. 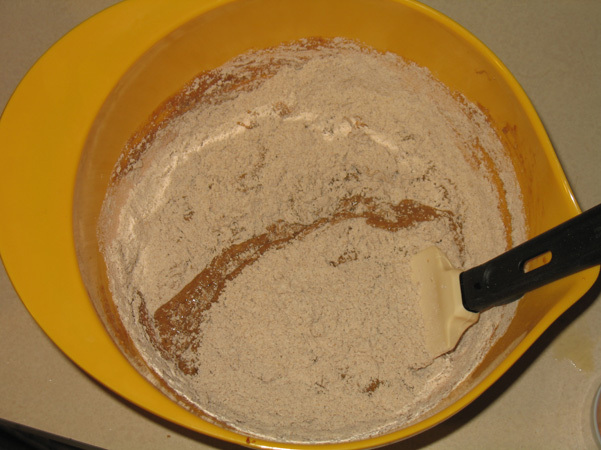 In another bowl, whisk together the flour, baking soda, baking powder, salt, and spices. 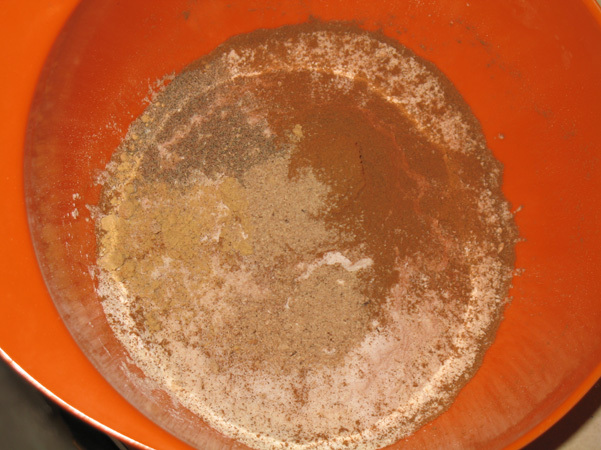 Gradually add the dry ingredients to the wet ingredients, mixing just until combined. Spoon the batter into the prepared pan. Bake for 30 minutes. 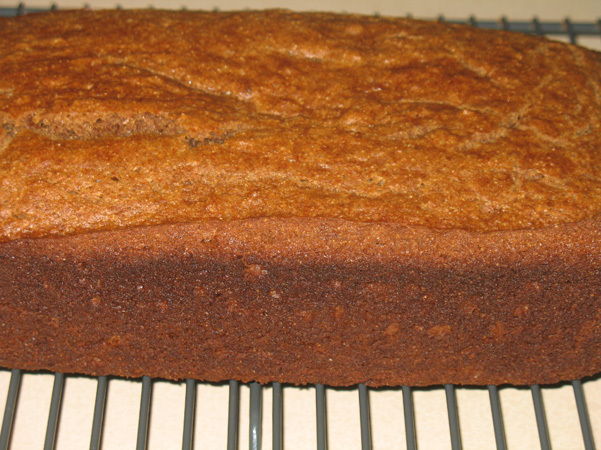 If you have a glass loaf pan, it may take up to twice as long to bake, so start checking at 30 and keep an eye on it. When a toothpick inserted into the center comes out clean, you are done! 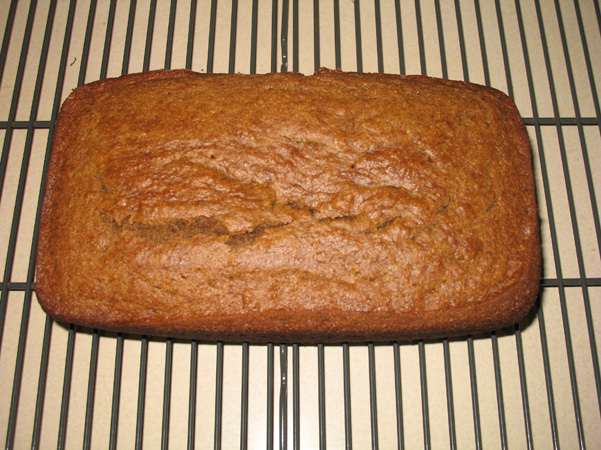 Let it cool in the pan for 15 minutes, then remove to a wire rack and let it cool completely.